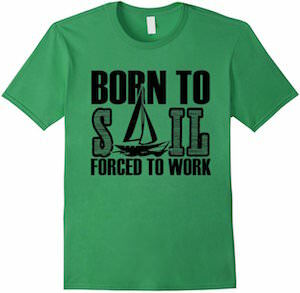 If sailing is your passion but you have to work for a living then this is the t-shirt you need. On the t-shirt you can see a sail boat and the text “Born To Sail Forced To Work”. And you can get this t-shirt in many color for both men and women. Made from 100% cotton this t-shirt is available in sizes Small – 3XL. Wearing this t-shirt to work is just perfect because then your boss knows what you are thinking about while you are not working. Get ready for some wind and then take out the sail boat and forget all about your work life. This t-shirt says it all, why work harder if you are not doing it smart. This t-shirt comes in many fun colors in styles for men, women and kids. On the t-shirt is just says in big letters “Work Smarter Not Harder” and that of course is a good tip and when you are really working smarter then you could still work harder of course because then you are like 10000% efficient and you then are of course the best of anyone. 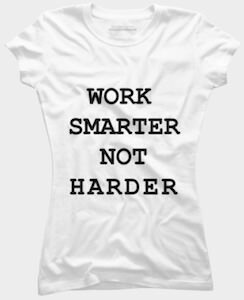 A t-shirt like this has a clear message and we can all learn something from it so get ready and start wearing this Work Smarter Not Harder T-Shirt. This t-shirt has a clear message that you want to work hard so that can support the once in need. 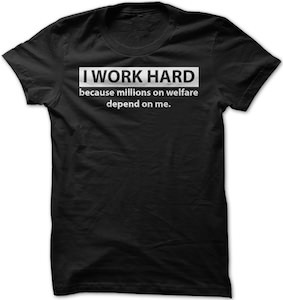 On this t-shirt is says “I Work Hard Because Millions On Welfare Depend On Me”. It’s a funny t-shirt but true because you pay your taxes and that money is used for the once that can’t work or need some help so by wearing this t-shirt you can tell the world to work hard to so that all our tax money can help a lot of people. You can get this working hard t-shirt in men’s sizes Small – 4XL and it is made from 100% cotton making it perfect for wearing when you are hard at work. If you would love to go on a cruise then maybe wearing this shirt around town could make it happen. 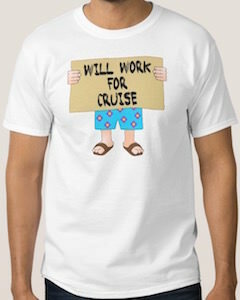 This men’s t-shirt shows two legs in shorts and sandals and above it a sign hold up by two hands and the sign says “Will Work For Cruise”. So just wear it and see if people will over you a job that pays in a cruise vacation so that you finally can wear those light blue shorts again. This cruise t-shirt is available in sizes Small – 6XL and also comes in different colors if you would prefer that. Yes you maybe a real talent at something but that doesn’t mean you will be the best because someone that works like 10 harder then you can get the work done quicker and just as good. 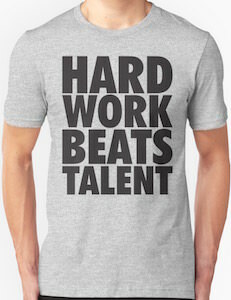 If you want to get this message across then this is the t-shirt to wear as it says in HUGE letters “HARD WORK BEATS TALENT”. You can get this unisex t-shirt in sizes Small – 3XL and it is available in many fun colors and if you don’t like this fit then you can even change that as it comes in fun cuts to. If you need to be safe and visible then you need a safety t-shirt like this. This orange t-shirt (also available in yellow) has many reflective lines on it so people can easily see you as light reflects on your shirt. And as working outside can be hot in summer they made this t-shirt moisture wicking so that you are comfortable while doing you job. This safety t-shirt is ANSI/ISEA Class 3 certified and is available in size XSmall – 4XL. Now you can’t complain that people don’t notice you as you will be so visible that you almost hurt someones eyes watching you. 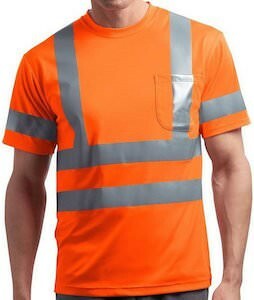 Come have a closer look at this Orange Reflective Safety T-Shirt. This women’s t-shirt shows the funny conversation between a toothbrush and toilet paper. The toothbrush says “I hate my job!” and then the toilet paper says “Seriously?” and I have to agree being toilet paper sounds so much worse. All in all it’s a funny t-shirt that will make people smile. 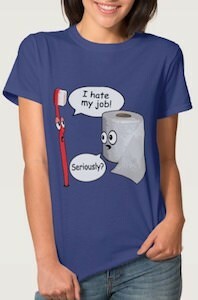 And this toothbrush and toilet paper t-shirt comes in many fun colors and is made from 100% cotton. You can get this t-shirt in sizes Small – 3XL and I am pretty sure that this will become one of your favorite shirts you own. Why don’t you have a closer look at this I Hate My Job Women’s T-Shirt. When working away the last thing you need is to be told how to do your job! 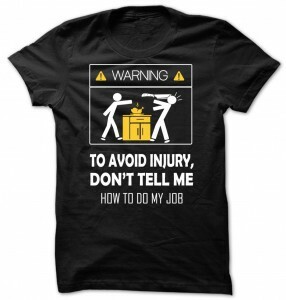 On the front of this t-shirt you will find the saying “To Avoid Injury, Don’t Tell Me How To Do My Job” along with a warning caution picture that has a chef stick figure throwing a knife at a customer on the opposite side of the counter. This is the perfect t-shirt for any occasion, it is available in a wide variety of sizes that range from Small to 3XL and choose from 4 different fun colors. Made from 100% cotton to give you a very durable and long lasting shirt that will also be super comfortable and soft to wear. Also check out the ladies fitted style of t-shirt with this print on it. Make your point with the Chef Don’t Tell Me How To Do My Job T-Shirt. OK you may be a suit but that doesn’t mean that you have to behave like one. 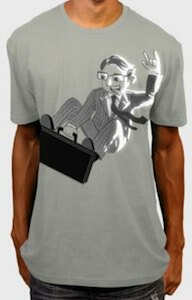 This fun t-shirt shows a business radical in his suit riding his briefcase like it’s a bull. As you can see the shirt is just fun to look at. It’s made from 100% cotton and is silver in color and comes in a wide selection of sizes. Maybe if you don’t want to be the suit all the time this t-shirt can help you to loosen up. Come have a closer look at this Business Radical T-Shirt. Do people say that you are kinda bossy or that you run the show so much better then the real boss? If so then this it the t-shirt for you. 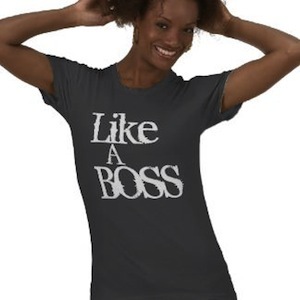 On this t-shirt it simply says “Like A Boss”. Any how this t-shirt is available in different styles and colours from men and women. Come have a look at all your options of this Like A Boss T-Shirt.